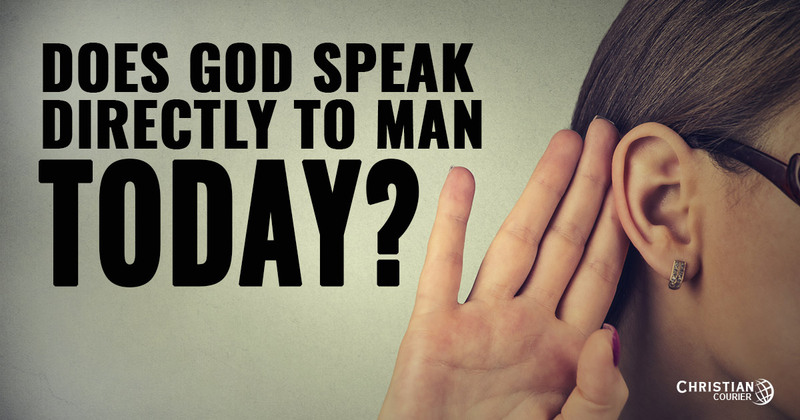 Does God Speak Directly to Man Today? Your friend has a very convenient method of authenticating what she wants to do. Unfortunately, it is a seriously misguided view that will end in disaster. When people want to believe something so badly that they will reject the revealed truth of the Scriptures and seek a direct response from God, he will allow them to believe what they will — even lies. Ultimately, though, they will receive an appropriate judgment as the consequence (see 2 Thes. 2:11-12). The writer of the book of Hebrews has summarized Heaven’s methods of communication to humanity. “God, having of old time spoken unto the fathers in the prophets by divers portions and in divers manners, hath at the end of these days spoken unto us in his Son” (Heb. 1:1). The foregoing text states several basic truths. God has spoken to man. He did so in times past in varying degrees and by different methods. Eventually, however, a change in his method of operation occurred. Yoday he speaks exclusively by means of his Son. The key question to focus upon, however, is this. What is the significance of the phrase “in his Son”? First, let us note some of the ways by which the Lord communicated with various individuals of the past. “I have given you every herb yielding seed ... for food” (Gen. 1:29-30). In Eden, the Lord spoke directly with Adam (Gen. 3:9). There were times when God appeared in a physical form and engaged the patriarchs in conversation (cf. Gen. 18:1ff). But these episodes say nothing about how Jehovah may communicate with humanity today—in the post-miraculous, Christian age. See our article on What Does the Bible Say About Miracles. In ages of the ancient past, God occasionally spoke to men in dreams as they slept (Gen. 20:1-7; 28:10ff; Mt. 1:20-21), but there is not the slightest evidence that he does so today. The Lord sometimes talked with men by way of visions (Mt. 17:1-9; Acts 10:9-17; 22:17; Rev. 9:17). But those times are past. There were periods when God used angels to communicate his will to a person (cf. Acts 12:1ff). [Note that in this instance the visit by the angel is clearly distinguished from a “vision” (Acts 9:17).] There is, however, no documentation for angelic appearances in modern times. Back now to the text of Hebrews 1:1. The book of Hebrews presents a contrast between how Jehovah revealed his will in the past (embracing both Patriarchal and Mosaic ages) and his mode of communication in this age. So it follows naturally that the inspired writer affirms that today (in this final dispensation of time) the Lord is not speaking by dreams, visions, etc., but exclusively by means of Christ through the New Covenant Scriptures. Note some of the evidence that supports this conclusion. The Lord Jesus did not encourage his followers to seek a direct communication from God throughout all time. Instead, he affirmed that the teaching which came from him would guide them to life (Jn. 6:63). It is by his word men would be judged on the last day (Jn. 12:48). Further, he indicated that his teaching ultimately would be conveyed through his apostles and other inspired persons (cf. Lk. 10:16; Mt. 10:19-20; Acts 2:42). When the noble people of Berea wanted to know the truth regarding the Christian religion, they did not wait for a voice from God to answer their concerns. Rather, they examined the Scriptures to determine the truth of the apostolic message (Acts 17:11). Paul affirmed that by a study of the Scriptures one would have sufficient information to furnish him completely for the accomplishment of every good work needed for the Christian life (2 Tim. 3:16-17). If the Scriptures furnish one “completely,” he needs no direct, audio message from the Lord. Jude explicitly affirms that the Gospel system, called “the faith” (cf. Gal. 1:23; 1 Tim. 5:8), was “once for all delivered unto the saints” (Jude 3). The expression “once for all” translates the Greek term hapax, which means “once for all time.” It is used “of what is so done as to be of perpetual validity and never need repetition” (Thayer, 54). There is no need, therefore, for on-going, direct communication from God. Finally, there is a very obvious fatal flaw in the assertion that the Lord is speaking directly to people today. Such a view allows anyone to fabricate out of thin air any claim he or she wishes with no demonstrative means available of either confirming or exposing the statement. How many times have we read shocking newspaper stories where some evil person has murdered a fellow claiming that God told him to commit the brutality? Does God condemn murder in the Scriptures, yet command the crime by direct conversation with some deluded soul? If one wishes to know the will of God on a subject, he must search the Holy Scriptures. This is the only source of sacred information relative to things spiritual (see 2 Tim. 3:16-17).